Ace "Fire Fist Ace, Hiken no Ace" Portgas D.
One of the most obvious features on Ace is his tattoos. Ace's back tattoo is left intact in the English version of the dub despite 4Kids' previous edits to crosses. At the same time Ace also promotes his tattoo to Luffy, something which is truly considered odd by 4Kids standards. Ace has a tattoo on his back of the Whitebeard symbol; a skull with a white mustache and a manji behind it. To avoid confusion between the two symbols and avoid slander for being a nazi, this was changed to crossbones in the shape of a "cross" in the anime, as well as in the most recent chapter of the manga.
) crossed out. 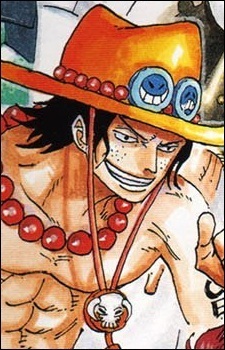 In the English version of the anime, Ace's shoulder tattoo signifying his name is edited out, as he is referred to there as "Portgaz D. Trace." He appears in One Piece Grand Adventure, once again without the tattoo on his arm. Ace travels around the Grand Line on his boat which is constructed so his Mera Mera no Mi fuels the engine on the rear end allowing it to move. Currently, Ace is one of the two known pirates to ever escape arrest by the Marine captain Smoker, the other escapee being Ace's younger brother Luffy. Ace and Smoker fought to a standstill in Alabasta. He left Fuusha Village three years before Luffy, and he is a loyal crewman and commands the Second Division of Whitebeard, his captain. In appearance, the two brothers are obviously related, despite the fact that Ace is more muscular than the rather lanky Luffy. He also sports rather childish freckles. He is apparently narcoleptic (a trait common amongst Ace's family) and therefore falls asleep on random occasions, making people wonder if he has dropped dead. As far as personality goes, Ace is much more intelligent, polite, and generally more bearable than his younger brother, which prompts the Straw Hat crew to question whether he is truly related to their bumbling captain. However, the brothers themselves are very close, Ace portraying typical good-big-brother behaviors such as asking the crew to keep an eye on his little brother. It is revealed that Ace had a bounty of 550,000,000 in the One Piece Ten exhibition. It is later revealed that Ace is not biologically related to Luffy at all, but is in fact the son of Gol D. Roger and Portgas D. Rouge. Ace took his mothers surname as a thanks for trading her own life while giving birth to him. Ace also hates his father for "abandoning" his mother. Anime Music videos are a great way for fans to express their love of a series, telling stories through the music and imagery that they have put together. There are a lot out there, but here are ten of the best we found for One Piece.